This is a game that should never have had to have been played in the first place. 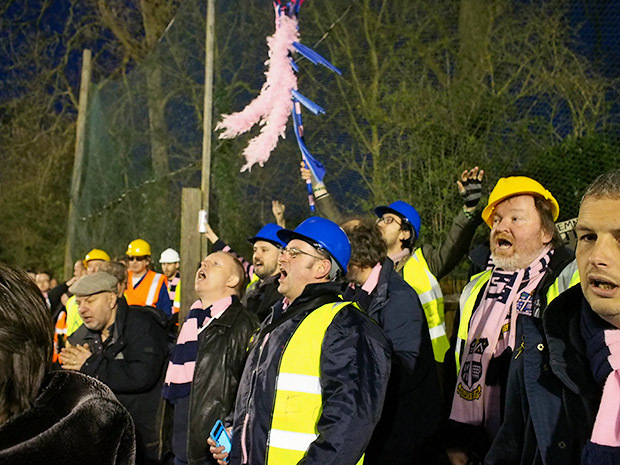 In January this year, the original fixture saw Dulwich Hamlet go 2-0 up with just 12 minutes on the clock. 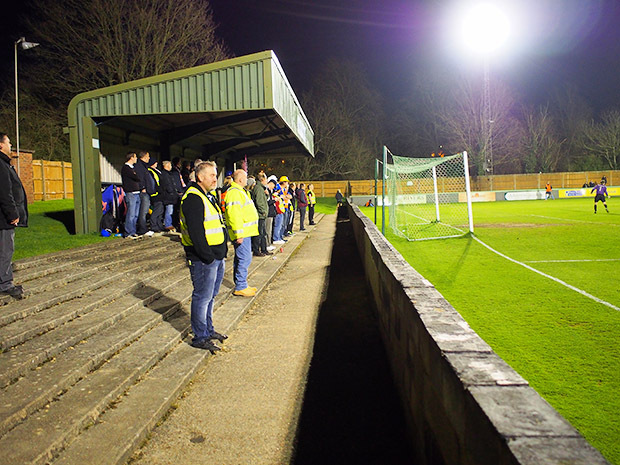 During the Dulwich fans’ celebrations a small chunk of Leatherhead’s shoddy perimeter breeze block wall collapsed. 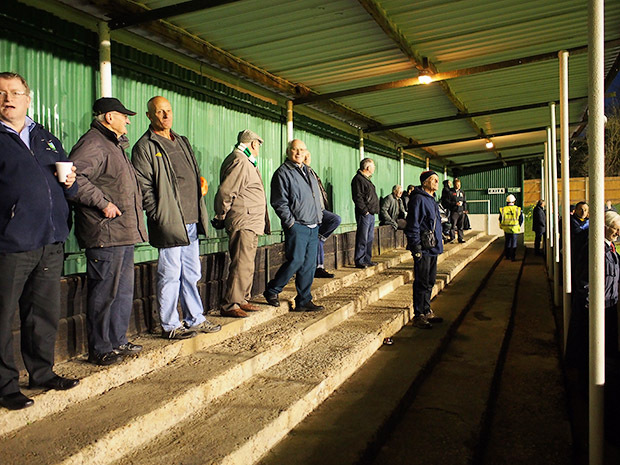 Despite the playing surface being clear of rubble, the ref decided to abandon the game altogether and the league criminally then declared that the game should be replayed, rather then the points awarded to Dulwich – despite Leatherhead being solely to blame for their crappy wall. 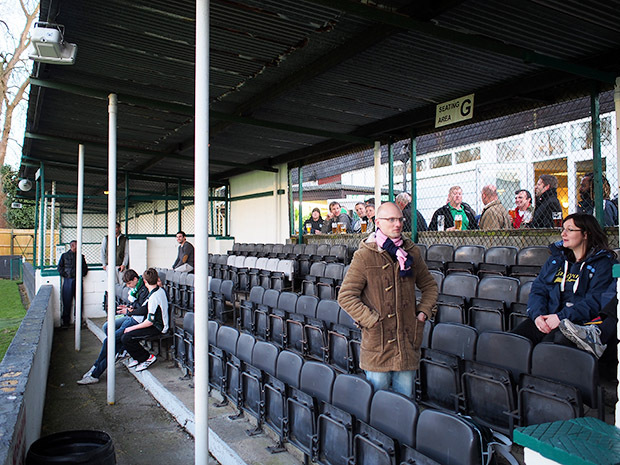 So it was with a certain sense of simmering resentment that die-hard Hamlet fans were compelled to make their second league visit to Leatherhead this year for a game that had effectively already been won. 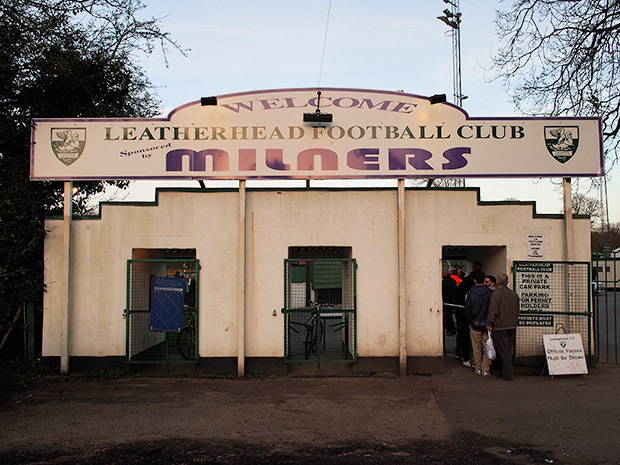 Everything about Leatherhead’s ground seems stuck in about 1930. I rather like it. 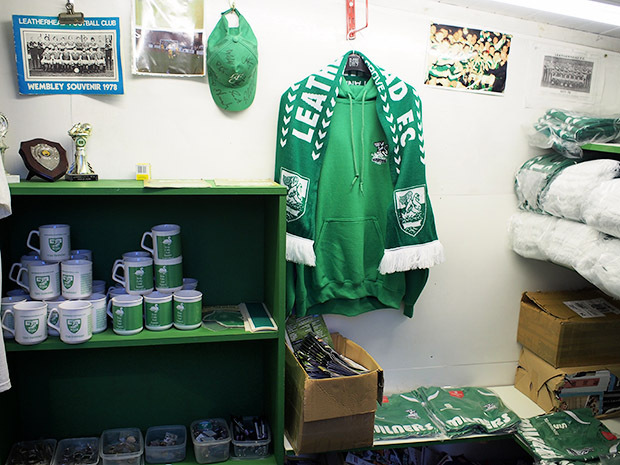 Apart from the collapsing, result-thieving walls, of course. 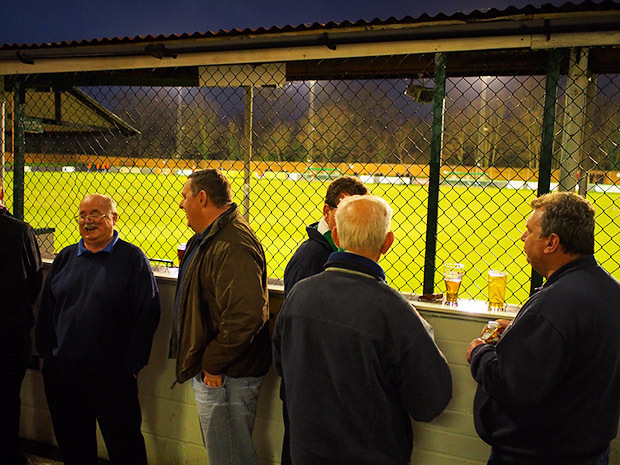 In the main shed with the bar behind the mesh. 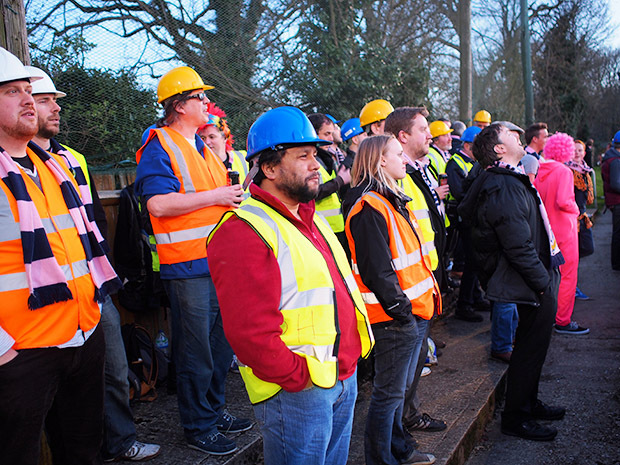 Keen to make a point about the dubious health and safety at the ground, Hamlet fans showed up in protective clothing. 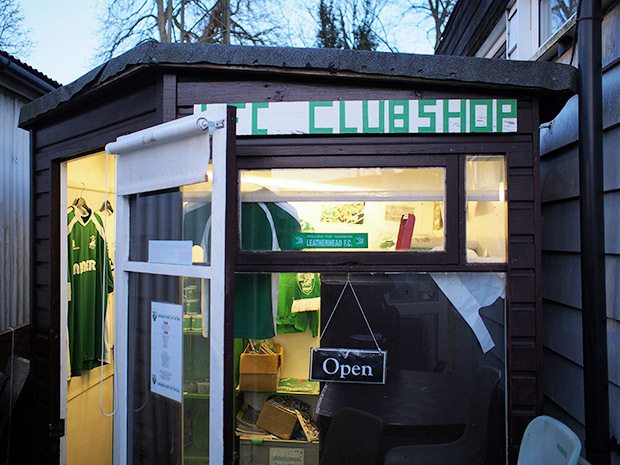 Leatherhead’s luxuriously equipped club shop. 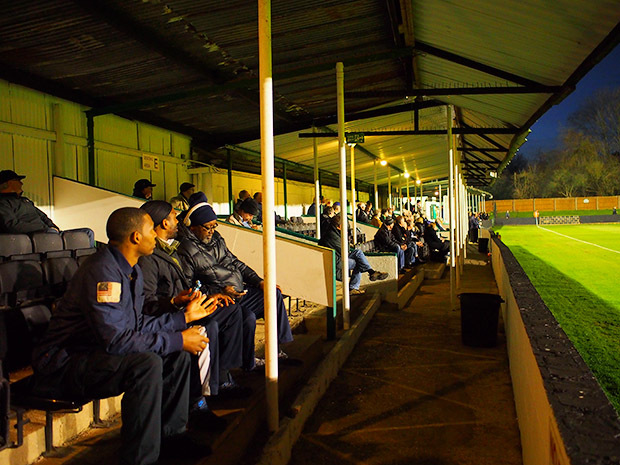 The main stand at Leatherhead with its corrugated iron roof. 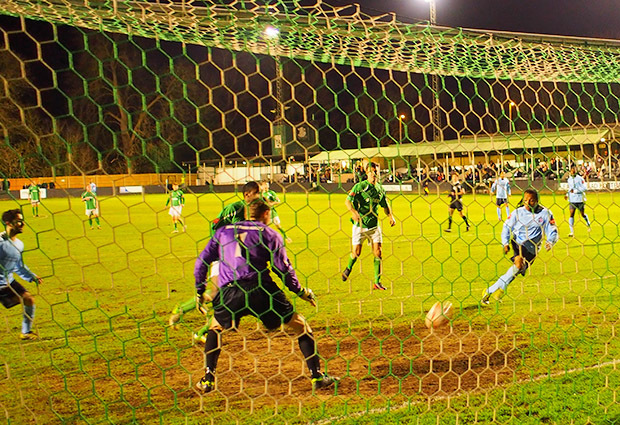 The football wasn’t great from either team, but Leatherhead managed to take the lead in the 15th minute. 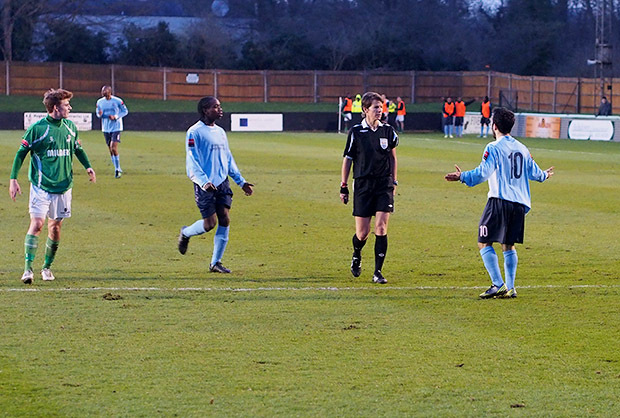 The referring was awful throughout with woefully inconsistent decisions made for both teams. 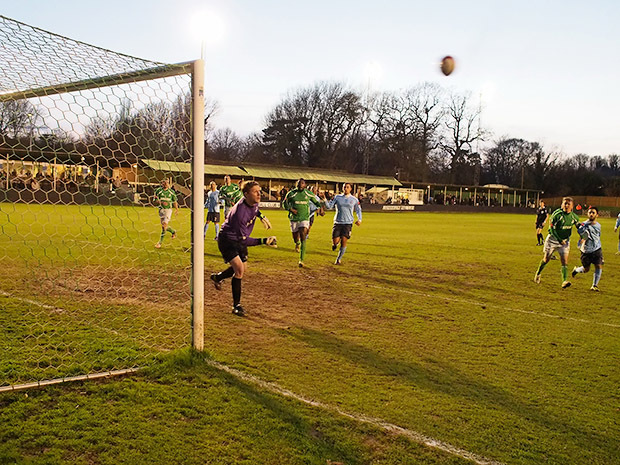 Dulwich came close towards the end of the first half, hitting the cross bar. 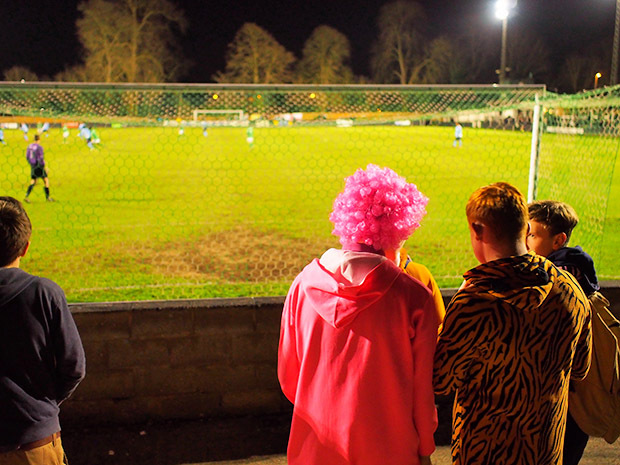 The Hamlet massive, complete with recently created stick. It failed to work its magic this night. 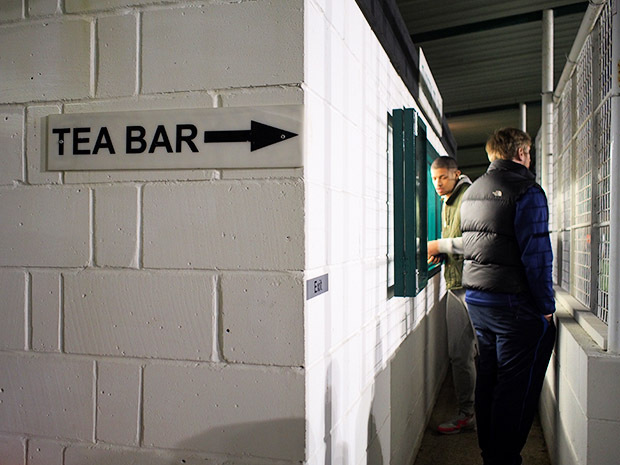 At the half time bar. 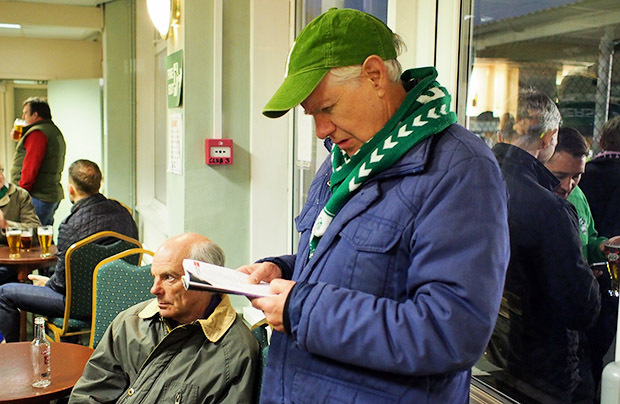 Checking the match programme inside the club house. 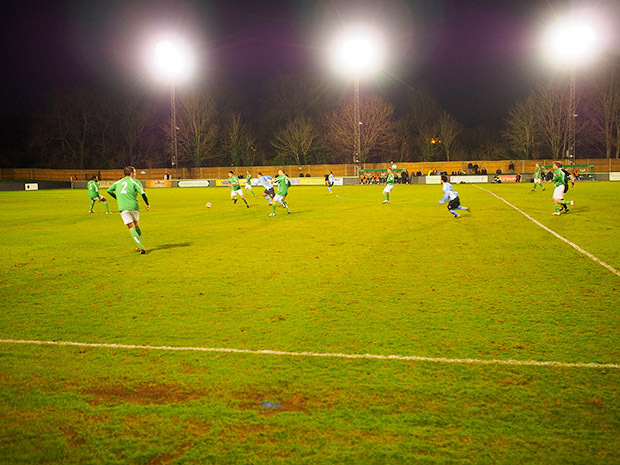 The second half wasn’t much better, with very little flowing football. 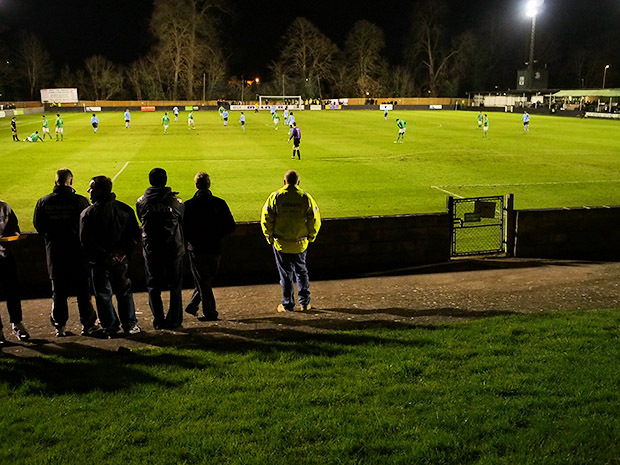 The main stand with its modest lighting arrangements. A view close to the section of wall that collapsed. 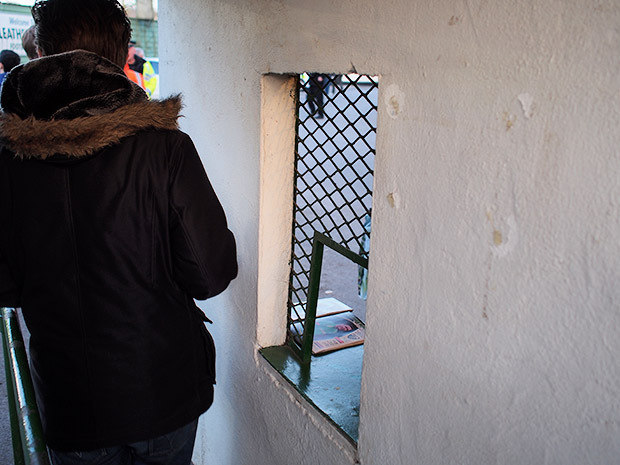 There was a quite ludicrous over-abundance of stewards on hand insisting that no one tarries for even a moment on the walkway in front of the wall. 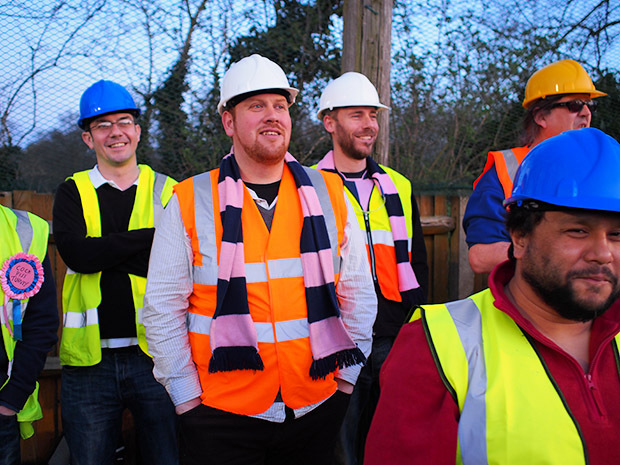 It was all a bit daft, and I told them so (in a friendly enough manner, I promise). After a moderately frank exchange of views, all was well. 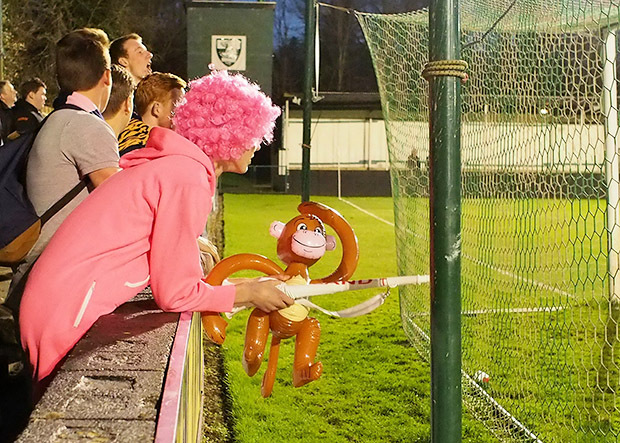 However, this sparked off the stadium’s very own Wealdstone Raider, a rotund, middle-aged chap who apparently ‘wanted to know.’ Silly boy! 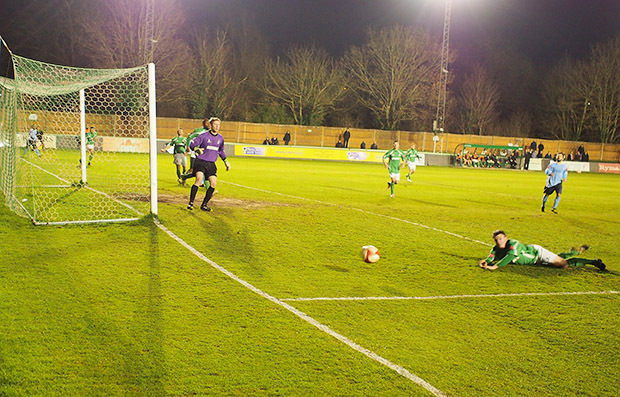 Back to the football, there was a lovely little piece of grass behind the stand. Be delightful for a picnic during sunny afternoon games. 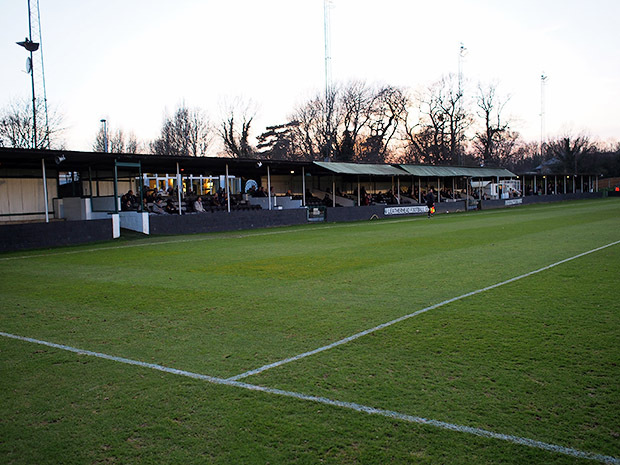 Dulwich put on more pressure as the minutes clicked away but they never really managed to stamp their authority on the game. 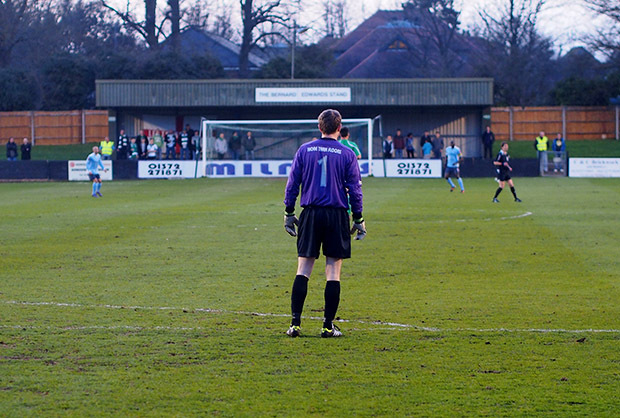 How no one connected with this goalie-beating thunderbolt was something of a mystery but it summed up Hamlet’s night: disappointing. 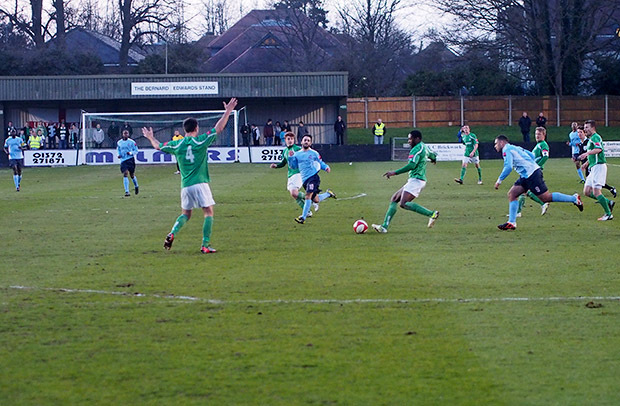 One last attack, but the result remained 0-1 to Leatherhead. 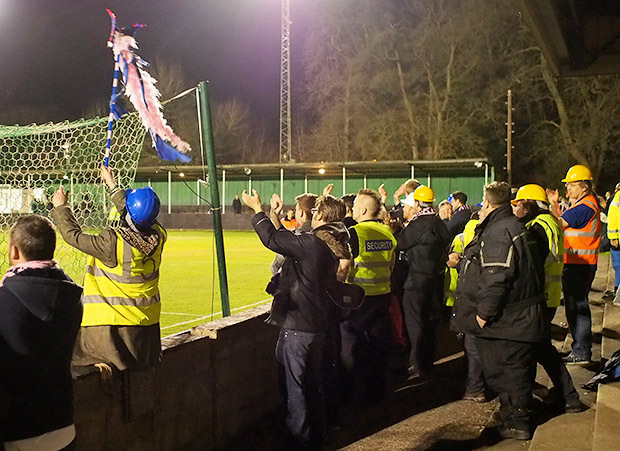 Full time, and the fans cheer on the Hamlet. Even with this setback, the team remains three points clear at the top of the table, so promotion remains firmly in the their hands. 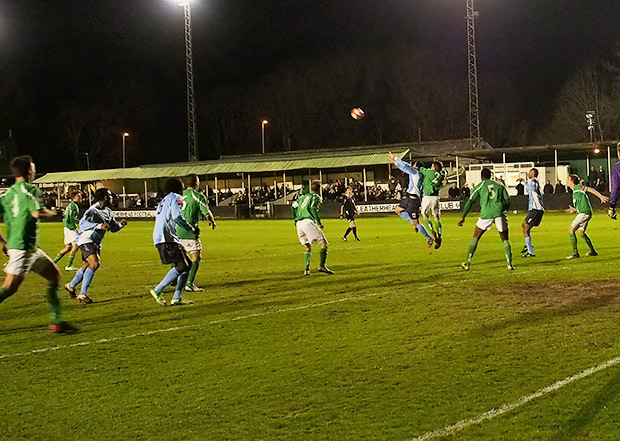 Come on the Hamlet!